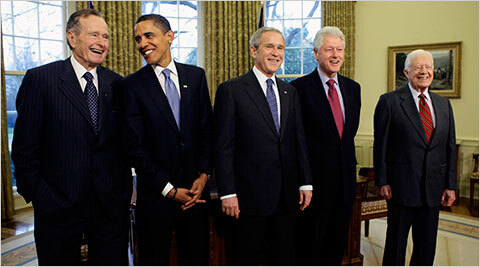 Yesterday there was this big photo-op where President Elect Obama sought council from former presidents Bush, Bush, Clinton, and Carter. It brought about an interesting optical illusion. The famous optical illusion is the one where you’re supposed to be able to see a young woman and an old woman intermittently. 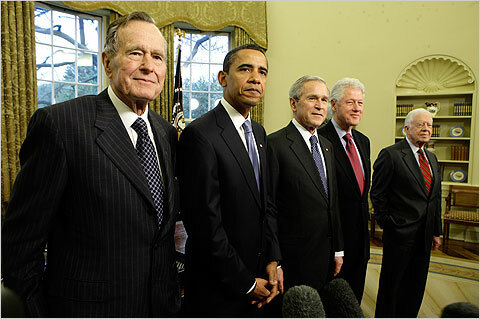 So the question with yesterday’s President’s Gallery photographs — is Carter snubbing Presidents Bushes, Obama, and Clinton or are Presidents Bushes, Obama, and Clinton snubbing Carter? My eyes can’t quite figure it out. I look at it one time and I see the others shoving Carter to the side. I look at it again, and I see Carter standing as far away from the others as he can. It really is something of a brain-fart, isn’t it? This entry was posted on Thursday, January 8th, 2009 at 8:33 am	and is filed under Uncategorized. You can follow any responses to this entry through the RSS 2.0 feed. You can leave a response, or trackback from your own site. I suspect this has to do with Carter’s stand on the Israeli invasion of Gaza. What i don’t like about the image is how Obama seems to be cozy among the Bushes. I figured Obama to be more of a Clinton or Carter man.